A university in the Philippines threw a graduation for its adorable mascot, Archer. 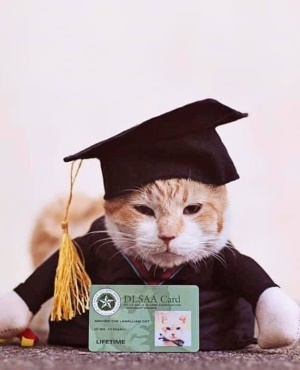 The De La Salle University (DLSU) organised a ceremony for its campus cat because the feline was being rehomed and will from now on be living with a university staff member for medical reasons. "We can't guarantee he won't be fed human food [if he stays] which is bad for his fatty liver level," Professor Laureen Velasco told local media. 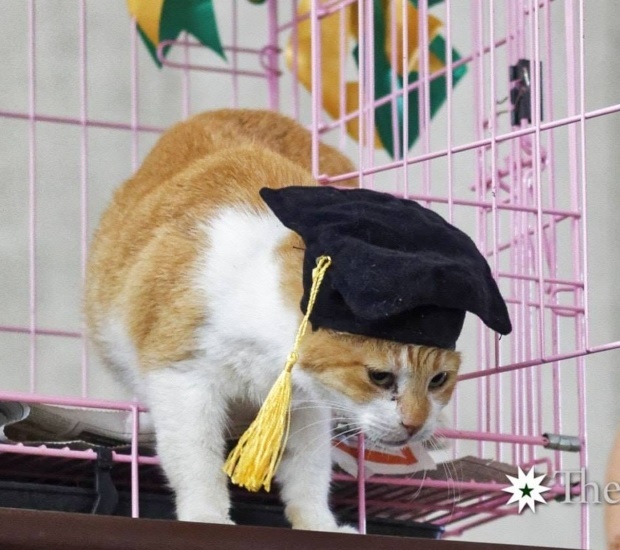 The hilarious ceremony took place after university heads decided to have a celebration for the ginger-and-white cat, who’s been at the university for six years. Archer was dressed the part and was even presented with a lifetime alumni card, according to reports. Although the tomcat may now be a graduate, the ceremony didn’t all go according to plan. As handlers opened the door to Archer's cage at the festivities, the kitty leapt out and tried to escape through the shrieking crowd. Luckily, the campus cat was quickly caught and brought back to his bash. Pretty soon photos and videos of Archer’s party were all over social media.